The latest update of WW2T (Version 0 1 40a) can be downloaded. It features Snipers for the first time and many smaller rule and user interface fixes. Cowering can now affect Fire Attacks, Close Combat attacks will allow you to ambush your opponent in woods and building hexes (including the possibility to withdraw). Defensive First Fire has been overhauled, you will no longer see three buttons but just one “Defensive First Fire”. Should certain units be afffected by Subsequent First or Final Protective Fire rules they still can combine their attack in a Fire Group with those not having fired yet. Descriptions for all scenarios have been added. 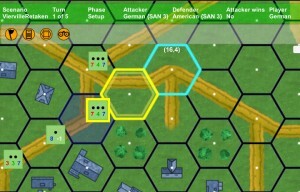 A new toolbar at the top of the map features buttons to easily access victory objective hexes, to show/hide map counters and to switch on/off the follow mode. Some of them can be toggled on/off via keyboard as well. 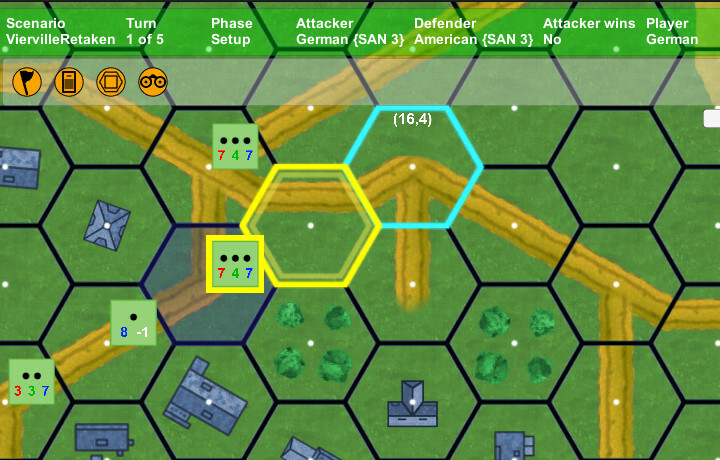 The F key/button switches your map to follow mode which automatically moves it to units and locations selected by your opponent. A new type of Event has been added which blocks/interrupts game play and is colored in red. It will appear in the Movement Phase when one player spends MF and the other has a chance to First Fire or Pass. Sniper Attacks and Checks are also blocking events that interrupt the usual game play during a phase. The Toolbar will display a specific set of Command buttons during those events. To quickly remove the topmost event(s) from your view hit the Space bar.